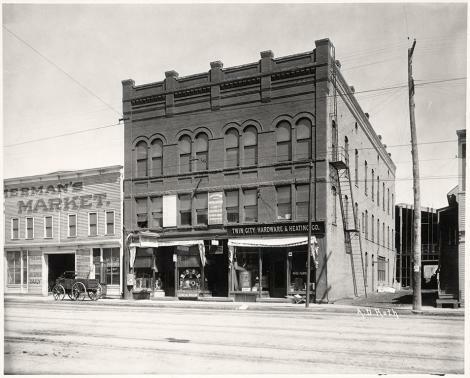 The Twin City Hardware Co. began as an old time hardware store in 1883, originally known as Twin City Hardware & Heating Co. In 1954, Mr. George Boomer, previously an assistant hardware buyer, became the owner, and within a short time, Twin City Hardware had transformed from the small hardware store of the 19th century to a supplier of many commercial jobs around the Twin Cities, including the State Highway Building and the Minneapolis/St. Paul International Airport. In 1971, a steel door and frame division was added. In 1974, a Minneapolis-based office and warehouse opened in Crystal, MN. In 1988, TCH first started using computers, increasing the speed of business. In 1992, Mr. Boomer retired, with his three sons taking over his responsibilities. In 1995, the Crystal location was moved to its present location in New Hope, MN. In 1999, a new 51,000 sq. ft. facility in Oakdale, MN opened, which the St. Paul headquarters, Wood Door Shop, and Hollow Metal Division all moved. In 1999, TCH went online as we launched our first website. In 2002, 4 neighboring acres were added to expand our shipping ability. In 2003, the Hollow Metal Division, the Boxing, Crating, and Palleting Department, the Installation Department, and the new Ingersoll-Rand Security Center all moved to the Oakdale facility. TCH continues to be a world class hardware distributor, currently operating five locations across the country, as well as the Midwest’s largest hollow metal shop.